Feed sticks for daily feeding. 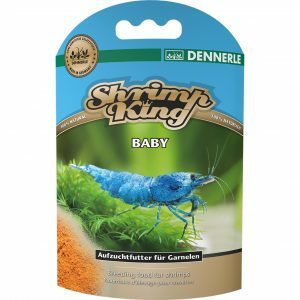 Containing all the important nutrients, substances needed for growth and vital substances that shrimps need for healthy, balanced growth, vibrant colouring and plentiful reproduction. Sinking, water-stable feed sticks consisting of 100% natural ingredients for a biologically balanced diet for freshwater dwarf shrimp. 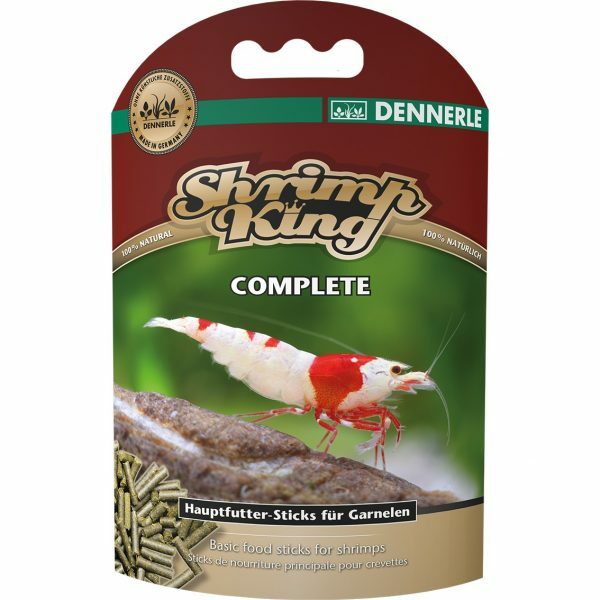 Shrimp King Complete contains all the essential nutrients and substances for growth that shrimps need every day. High-quality proteins and essential amino acids from aquatic animals ensure balanced growth. Dietary fibre from various leaves and bark supports healthy digestion. Vitamins and vital substances from different types of algae and vegetables act as “lubricants” for a functioning metabolism. ß-glucan from yeasts supports the body’s own defences. And natural carotinoids promote the full development of species-specific colouring. As a result of the numerous ingredients, each individual feed stick already contains a varied diet. 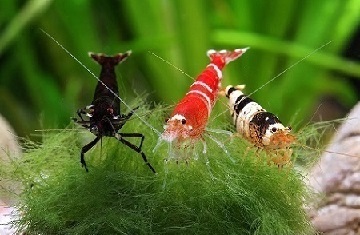 Premium shrimp food made in Germany. Tip: Shrimp King Complete is also ideal for feeding crayfish, dwarf crayfish (CPOs), crabs and snails. 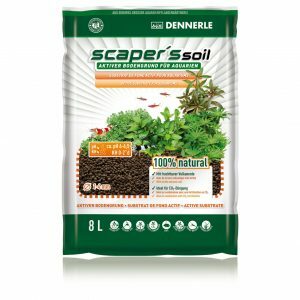 From Olivier I've been using this product for some time as a base meal for my shrimps, they love it, I also use all the range of supplements. If you have to buy one, this is the one. Why isn't 10 stars possible? This product is the BOMB!! Shrimps go crazy when I add this to the tank, they absolutely love it! They seem a lot more active and colourful since I started feeding this. Buffet for your shrimp You know that feeling when you are at a work function, wedding or at a party you really don’t know anybody. You have your drink in hand, making small talk to whomever would listen to you, starving from the long drive you had to make to get here and the buffet has just been opened. You are drooling over the mini ginger brownies, cheese & pesto whirls, chinese buffalo wings and sushi pieces but you try and keep yourself in check. You are not going to be the first person to run to the buffet and take something! That honour is left to the overweight HR manager or the aunt that flew in from Ireland to do. You walk around the table and try to keep your drooling to a minimum while making shy eye contact with other lost souls doing the same. But you keep strong, you will not be the first person to take something. Then it happens - some random giggling girl needs a little protein to line her stomach with before she drinks the third glass of champagne the best man is softening her up with. She takes the first piece of sushi and then all hell breaks loose. You jump over the old lady that just walked in front of you, nudge the office manager’s 16-year-old son out of the way, dive between the waiter’s legs and grab the second plate out from under this random dude you think you have seen working at McDonalds. Everybody is now grabbing food and stuffing their faces. It looks like a massacre of epic proportions. This is basically the situation when you drop a piece of Shrimp King Complete into your tank. At first, they just jump around it, then some may come closer and look, but then they leave and continue the dance. But as soon as one of them starts snacking on a piece everybody jumps in. It would almost seem like you haven’t fed you shrimps in a year. 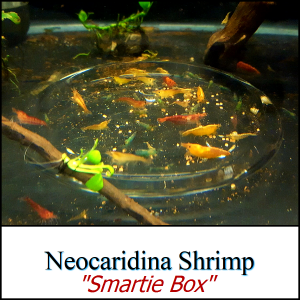 One of the best loved and most swarmed food I can give my shrimp. Colours also seem to be improving and they seem happier and chattier after I have fed them a couple of pieces. Try it yourself, you will not regret it.